WARSAW — A Warsaw woman told a Kosciusko County judge on Monday, Feb. 11, that behind bars is the only way she’ll be able to overcome drug addiction. Danielle Marie Hughes, 27, 14 EMS B61B Lane, Warsaw, pleaded guilty to multiple charges in three separate cases in Kosciusko County Circuit Court on Jan. 16. Those charges included two counts of possession of methamphetamine, failure to return to lawful detention, resisting law enforcement and identity deception, all level 6 felonies as well as a class C misdemeanor charge of possession of paraphernalia. Through her attorney, C. Austin Rovenstine, Hughes asked Reed to allow her to enter the drug rehabilitation program. Hughes was in court for sentencing on three cases while also currently incarcerated for a fourth, which involved accusations of dealing narcotic drugs. It was while serving her sentence on work release in that case that Hughes’ new troubles began. On Aug. 31, 2017, work release officers brought Hughes to the county jail for failing a drug test. During an ensuing strip search, officers reported finding a quantity of methamphetamine, as well as a glass smoking pipe and pills identified as Adderall and Suboxone, all contained in a plastic bag and inserted into a body cavity. On March 26, 2018, police say Hughes was involved in a traffic accident where she was driving and allegedly told officers she didn’t have her license on her person. Instead, police say Hughes produced a social security card with the name of someone other than Hughes. She was then transferred to Parkview hospital where she also gave that alternate identification. According to the affidavit of probable cause, the woman whose name was on the social security card contacted police to report that the Indiana Bureau of Motor Vehicles planned to suspend her license for failing to report an accident. That same woman reported having her social security card stolen. Police added that officers were contacted by the county jail stating that Danielle Hughes arrived at the jail to visit an inmate and that Hughes attempted to identify herself as the woman she had earlier portrayed during the March 26 accident. Hughes was finally apprehended on July 12, 2018, when she was pulled over by Warsaw police, who identified her as Hughes and who knew she had three active felony warrants. Police reported that after Hughes initially stopped the black Ford Thunderbird she was driving, she then sped away, leading police on a high-speed chase that ended in a cornfield where police say Hughes and her two passengers attempted to flee on foot. According to police, Hughes told officers that she was driving the vehicle and that she was on her way to purchase a half pound of methamphetamine. Inside Hughes’ bra, officers reported finding $1,130.55 in cash. “That was one of the dumbest things I’ve ever done in my life,” said Hughes at her sentencing. Reed sentenced Hughes to three one-year sentences, as well as a pair of six-month stints for the two methamphetamine possession charges. 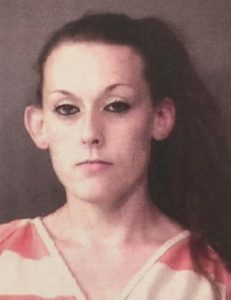 She also received 60 days in the Kosciusko County Jail for the paraphernalia charge, to be served concurrently with one of the possession charges.